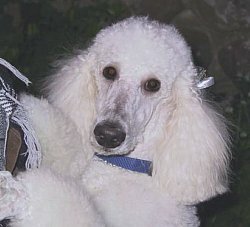 Beyond the crazily named poodle breeds such as the Cocker-Poo and Labradoodle, the American Kennel Club recognizes the standard, miniature and toy varieties of poodles. Each breed carries the same physical and mental characteristics and the only difference is the size. Toy poodles measure less than 10 inches in height, a miniature is a poodle that is between 10 and 15 inches and a standard sized poodle is anything above 15 inches. The smaller the poodle breeds are, the more people associate them with having good hair but no brains. This couldn't be further from the truth, as they are intelligent and loving dogs, and are one of the easiest to train as they understand complex instructions quickly. The poodle has been a part of human life for many centuries and it's possible to find pictures of the poodle's forerunners in Ancient Roman artifacts. 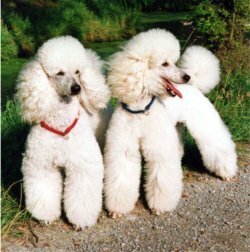 The original usage for the breed, even back in antiquity, was as a water dog, and the current poodle haircuts stem from this time. The clumps of hair are where the joints and vital organs are to keep the dog warm in cold water. Even the ribbons in the hair are less of a fashion accessory and more of a way to see your dog as it swims in the water after downed ducks and geese. 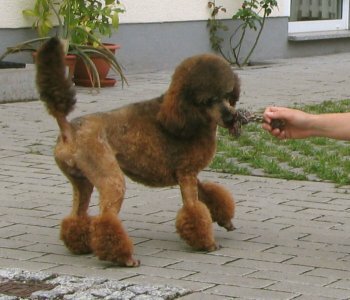 Since then, poodles have become adopted as family pets for their loyalty and quick learning, which has seen them also, become part of circus acts. Owning a poodle can be a great experience as they are eager to please and love to spend time with humans as well as other dogs. This makes them a great family pet as they don't mind being pushed around by younger children and will actively seek out human company. This does mean that they are not suited to a kennel outside and would need somewhere to sleep inside the house. You'll know that they accept you as pack leader when they greet you with a bowed head and lick your hands and face. Once this has been achieved, you can train them to do just about anything you want them to do, and they will respond well to simple human praise and affection. Poodles can be indoor dogs during the day, but do have a good amount of energy that you'll need to help them burn off with a daily walk. They are quite happy around other dogs, so you can just take them to a dog park and let them roam. However, they do like to please, so be prepared to play many games of fetch. 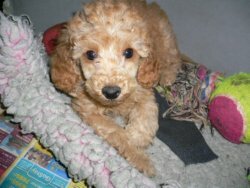 Poodle breeds are long life dogs, living typically 12 -15 years and longer in some cases. They are prone to eye diseases such as retinal atrophy and cataracts later on in life. They also can suffer skin diseases because of over grooming. Finally, they are very susceptible to bloat, so it will be important to feed your poodle two or three smaller meals a day rather than one large meal.